We all love a cup of tea in the morning, or a pot of tea when granny visits but have you ever stopped to think "what is tea?" And why are there so many different kinds? Read this handy guide to tea before you head out to the shops for your next box of tea, and maybe this time try something new! Tea is a flavoured beverage made by pouring boiling water over the dried leaves of the Camellia Sinensis bush. 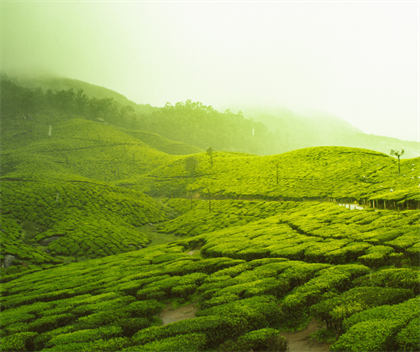 The tea plant grows widely throughout India, China and other areas of the world where there is a warm semi tropical climate with high rainfall. Teas made from other plants, such as Rooibos, are technically “herbal infusions” and not true teas. 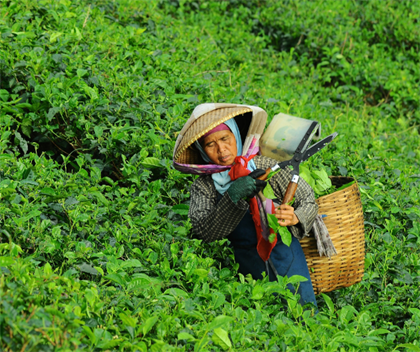 The tea leaves are hand picked and then steamed or dried, aged or fermented to develop different flavour profiles. The longer the leaves are aged, the darker the colour and the flavour of the tea. All true teas contain tannins and caffeines at different levels, depending on the degree of oxidation. 5. Herbal infusions: technically not true teas, these are dried or fresh infusions from other plants, herbs, flowers and fruit. Popular examples are Rooibos, chamomile, mint and berry ‘teas’. Does not contain caffeine. English breakfast: this is popular blended tea, mostly drunk in the English speaking world. It uses leaves from Assam (India), Sri Lanka and Kenya. Each brand of tea has a special recipe for their blend. Ceylon tea: this is a black tea from Sri Lanka, formally known as Ceylon. It is a single origin tea. Darjeeling: this is a black tea grown in the Darjeeling province of India. It has a lighter flavour than other black teas. Earl Grey: this is a black tea flavoured with oil of bergamot. Bergamot is a citrus fruit, that is very fragrant and fresh smelling. Rooibos: is a herbal tea made from the leaved of the fynbos plant Aspalathus linearis, indigenous to southern South Africa. It makes a red tea that has gentle honey flavour. Chamomile: a herbal infusion made from dired chamomile flowers. It makes a light yellow drink, which has no caffeine and is believed to aid sleep, relaxation and digestion. Mint tea: this herbal infusion is either made from dried, crushed mint leaves or from fresh picked leaves. The dried leaves make a stronger, darker flavoured beverage that is believed to settle your digestion after a heavy meal. Is it milk first or tea first? Ah the age old question. Well, really it depends on how you like your tea. Many tea lovers choose not to take milk in their tea at all, while some will only drink tea with milk added. Historically, it was a question of the quality of your tea set that determined the way you poured your tea. Expensive porcelain tea sets were liable to crack if you poured the hot tea in directly, so the milk was added first to prevent this. Pouring milk first became a more upper class way of making tea, that gradually was adopted and continues to this day despite there being no practical reason for it. It really just is a matter of taste!